How to Edit Model Elements with Excel? 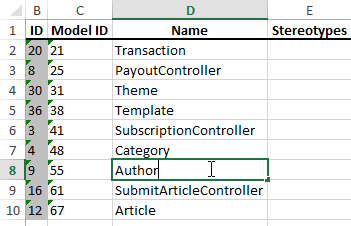 Current: How to Edit Model Elements with Excel? Export project to Excel file to take advantage of its extensive built-in functions to perform analysis, calculations and generate charts to read the models from a different perspective. Besides, you can update the exported Excel file and import it back to synchronize the changes to models. In this tutorial you will learn how to export several classes into Excel, make changes, and then import the changes back into Visual Paradigm. Select Project > Export > Excel... from the application toolbar. 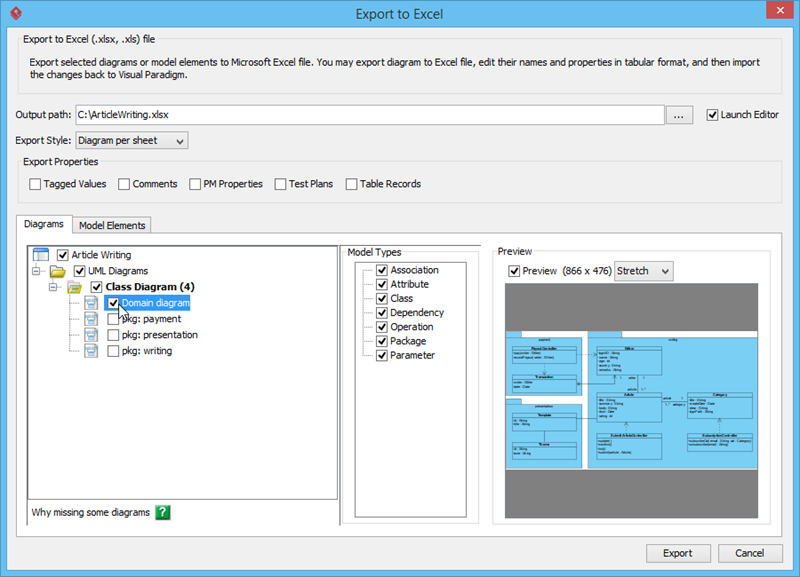 Select the diagram(s) to export to Excel. Select an Export Style. We will try Model type per sheet this time. An Excel file is produced. Open it. Since we selected the model type per sheet option, data is organized in each sheet by model type. Open the worksheet Class. You can then type some formulae to perform calculations. 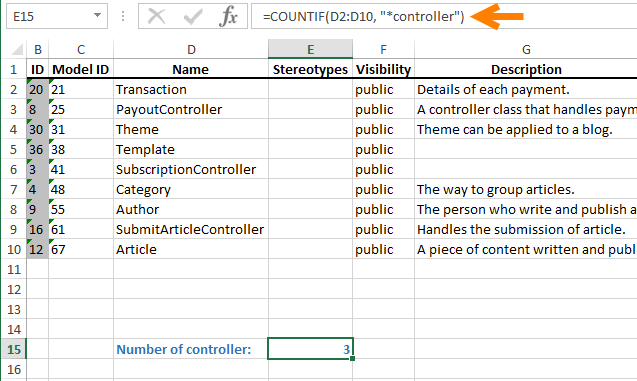 For example, the picture below shows a formula that calculates the sum of classes whose name has "controller" in it..
We can modify the data and then import it back to modeling tool to update the models. 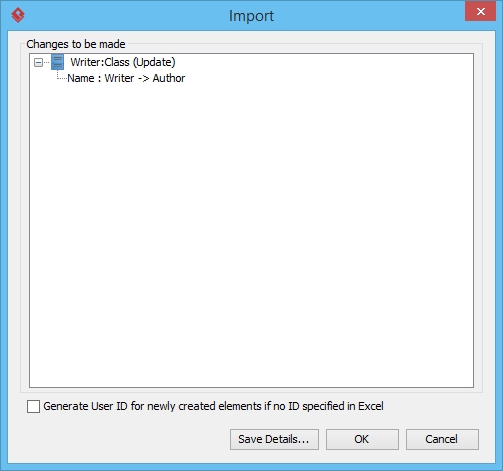 For example, change class name from "Writer" to "Author". Note: If you want to insert some extra content to the exported Excel file instead of modifying just model properties, make sure it won't disrupt the exported content. Otherwise, the file may not be able to import back to the source project. To avoid disrupting the exported data, enter in a far away cell. The best position would be at least the fifth row below the last content. Go back to Visual Paradigm. Select Project > Import > Excel... from the application toolbar. The Import window shows what changes will be made to the models. Click OK to confirm. 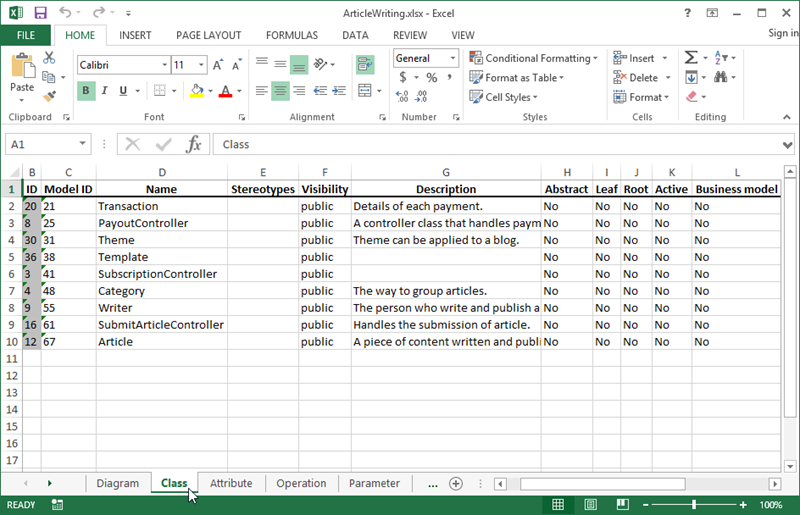 The model is updated following the change made in Excel.